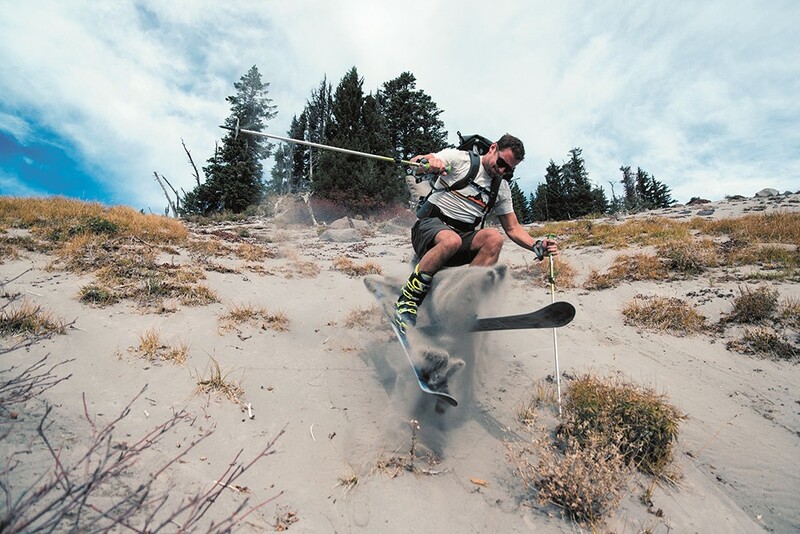 The author has skiied every month for five years. We had already skied Mount Hood's Palmer Snowfield after sleeping in the parking lot the night prior. Figuring a few turns on the bare sandy hillside would make for cool black-and-white photos, we set off into the heat. The sand lapped at my legs. Each hop turn kicked the volcanic pumice into the air and down into my ski-boot cuffs, sandblasting my shins raw. Twenty-four consecutive months of skiing was in the books. In August, despite the fact loose dirt is more present than snow on the higher aspects, especially on volcanoes, it felt good entering my third year of skiing year-round. It felt even better to have a partner make the trip with me from Spokane. Much of the past two years were spent solo to find that stubborn patch of summer snow tucked into the eves and shadows avoiding the sun's heat. August through October are the toughest months. The temptation to waterski or hike outranks the trek into the hills with 40 pounds of ski gear to knock out a few sun-cupped turns. Yet knowing you have linked one more month onto a possibly endless chain of ski memories is the driver. "Why aren't more people insane (to ski year-round)?" I thought of the sand that can still be found in my boot liners three years later and the wet hikes back to the car with purple lips and shaky hands. The procrastination until the last day because life gets in the way. The incessant buzz in my head of, "Where am I going to find snow?" and the inevitable doubt of not only finding a patch but also the motivation to reach it. But, with every mad dash for the slim summer pickings, blower boot top powder and hot laps under the chair with friends from November through May fueled the insanity. Once the maps are out and ski gear dusted off, the plan begins to take hold and I know it is all worth it. Assisting me on this maniacal journey, the ski-year-round contingent has grown through the years. I now see more familiar faces high in the hills, hiking around with ski gear on their back in knee-deep bear grass. This fall, on Month 60, I saw a guy dressed in a full purple teddy bear costume with a leopard speedo. He said it was his 12th month of consecutive skiing and he planned to continue the streak. Occasionally I ski in a jean vest and coonskin cap. Maybe Alex's sentiment is right; we are insane, and the group is growing. The original print version of this article was headlined "You Are Not Alone"